Over the last season I’ve turned into a Nascar fanatic. I love the sport. The skill and precision required, the drivers, the noise and the competitiveness are things F1 can only dream of. Don’t get me wrong, I am a huge F1 fan, but there are some things that Nascar does that no other series can match in quite the same way. As far as games go, the series hasn’t really been represented as well as it could have been in the past in some ways. This game, while it does up the ante in gameplay and graphics terms from the last EA Sports title back in 2008, also lacks in some areas when compared to that game. The driving mechanics, controls and graphics are all very strong in this title. I have no real concerns there. Where it fails to impress is predominantly in the presentation and career mode. The career is very linear, you simply play through each event of the 2010 Nascar Sprint Cup season, and that’s it. During each race you earn NXP which unlocks new liveries for you to use in single player quick races. It also unlocks special challenges with varying objectives which you can complete to earn trophies and other rewards, but they didn’t really do much for me. I would have preferred a far more immersive and interactive career mode instead. During the career, you can attract sponsors by completing a list of requirements on the sponsor page in the career hub. These range from finishing in the top 10 to qualifying on pole a set number of times, as well as the obvious ones like win a certain number of races. You never really have to work hard to obtain sponsors and you can’t pick and choose, you simply seek to acquire all of them over the course of the 36 race season. In EA Sports Nascar 09, you signed contracts with teams and sponsors, and you had to complete your objectives to keep them and progress up the ladder to the best teams and sponsors. You felt like a racing driver struggling to make it in the sport, and having to work to progress, and here you never feel like that. Another major omission from this game that was present in Nascar 09 are both of the other major national series’ of Nascar, the Camping World Truck Series and the Nationwide series. This is a huge loss in my opinion as it means the career mode can’t allow you to progress through the ranks over a number of seasons like you could previously. It also means that you lose out on the experience of driving the different cars with their unique handling, as well as all of the drivers and liveries from each series. Not only this, but not all of the 43 Cup Series regulars are in the game, and some drivers are substituted from the Nationwide series, such as Danica Patrick. I think for this type of game, they could have done a better job of including the full roster of drivers and I really hope to see far more content in next year’s game as well as a much stronger offering for the career mode. One area where the developers do go out of their way to give something cool back to the fans, they model many different liveries for a lot of the drivers, sometimes as many as four different ones per driver. For guys like Denny Hamlin who has a different FedEx service on his car each week, this is a nice addition. Strangely, despite the variety of cars and the effort that went into creating those extra liveries, that effort and variety sadly didn’t carry over to the presentation. After each race win, your driver celebrates with champagne on the roof of their car, while the same droning crown cheer sound repeats. It’s enough to drive you mad after a while, especially because it’s so cheap that they didn’t mix things up with variations at all. I’ve seen quite a few celebrations in victory lane by this point too, and I don’t recall anyone spraying champagne at all, so maybe they were getting their wires crossed when they designed that woeful animation. The presentation before and during the race however is actually top notch. They have nice introductions to each race with a description of the track and a look through the grid positions. In the race, the sport itself is translated into game form very well. Engines sound incredible which is fantastic as it’s one of the most important audio aspects to get right in any racing game, and many of them fail spectacularly. The spotter audio isn’t quite so great as he can get a bit irritating at times, especially when trying to be funny. I still don’t understand a couple of the things he says. Rather than go further into the gameplay side of things, I’ll just summarise by stating that it’s very strong and racing in a pack really feels fun. When you’re alone on the track it can be less fun but it really depends on how much of a fan you are. Some will crash into the wall because of not having a car in front to use as a reference for when to slow down or brake, but others will relish the challenge of driving the perfect racing line, which is harder than it looks when you’re pushing hard. Driving long races of around 10 to 15% length is very fun when you play on higher difficulty levels (medium or above), especially when you have fuel and tyre wear on and at the max 4x the normal rate. You can sometimes use strategy and tyre and fuel management to pit less and win the race that way. I’ve had a few races that I’ve pitted only once and had a practically empty fuel tank while crossing the finish line which was a great feeling as you think you’re not going to make it through the last lap at racing speed. The game is a bit buggy at times which is frustrating, but luckily these bugs appear to plague the online aspect of the game far more than the offline portion which is good. Sometimes you get bugs when in career but luckily they’re few and far between. The next patch should fix most of these issues too so I’m looking forward to that. 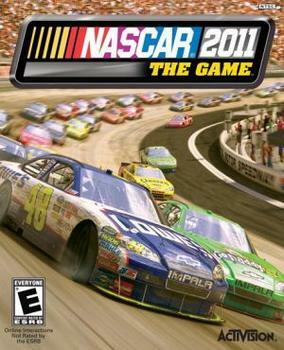 Overall, Nascar the game 2011 is the game fans of the sport have been waiting for since 2008. It is a solid first entry from Eutechnyx which they can build on in the coming years. It is lacking in several key areas and that’s a shame, but the gameplay is so fun that it should certainly give true fans a lot of enjoyment and the pros definitely outweigh the cons. If you’re not a massive Nascar fan, then it’s probably best to start with Gran Turismo 5 as it’s overall a far superior game and better value for money. If you play the limited Nascar portion of GT5 and are left wanting more, then this is a solid purchase especially if the price drops which I would suspect is pretty likely by now.